The opponents of the 512 St. Clair streetcar right-of-way don’t miss any opportunity to slag the line. The TTC doesn’t help when it does not fully explain what is going on with this summer’s construction projects, and paints the work primarily as “accessibility” and “new streetcar” related. A common complaint in Toronto is that nobody co-ordinates construction projects. Well, for those who bother to pay attention to the announcements of such things, co-ordination on a large scale is happening, and St. Clair is part of it. Many projects fit together like a jigsaw puzzle this summer. St. Clair Station bus and streetcar loops require structural repairs that will take from now until late in the year. This has nothing to do with accessibility (the station already is accessible), nor with overhead changes for new streetcars (new pantograph-friendly overhead has been in place since 2011). The ramps leading into St. Clair West Station Loop were not rebuilt during the line’s shutdown a few years ago (this is the only part that was, for some reason, omitted). They are the original installation from the Spadina subway opening and require reconstruction. St. Clair West Station is not accessible, and work on this will begin this summer. However, that has nothing to do with the shutdown for all bus and streetcar routes serving the loop. The overhead within St. Clair West Station must be converted for pantograph operation, but this is work that would typically be done overnight, or at most over a weekend. Presto conversion of St. Clair West Station can be conveniently done while the station is closed, but did not strictly require it. Reconstruction of small sections of the islands on St. Clair is required for proper operation of the low floor cars’ boarding ramps, but these island also require electrical fit-outs for Presto. This work is similar to that was done on Spadina. Track construction at College & Bathurst prevents streetcar operation including access to St. Clair (although if this were the only issue, it would be handled by storing cars at Hillcrest or on the line as has been done in the past). The controlling factor is the ramp construction at St. Clair West. The Bathurst trackage will re-open in mid-July. Work on College Street West by Toronto Water and as part of local street improvements for the BIA requires partial street closures. This has been co-ordinated with TTC trackwork at Bathurst and at Lansdowne. 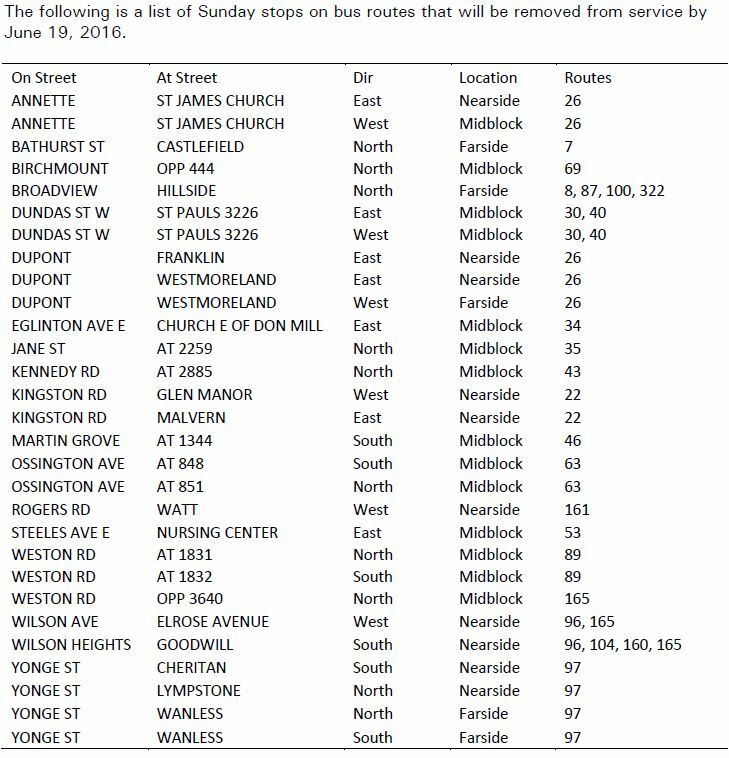 In all of this, if one wants to knock the TTC, one might ask “why were the islands not done sooner” and “why were the ramps at St. Clair West left so long”. As for the islands, that’s partly a head-scratcher for accessibility, but Presto is a net new requirement. I suspect that the work could be done in under two months, but co-ordination with the other projects makes for one shutdown, not two. The ramps are another matter, and I have never heard an explanation of why this work was not done during the previous shutdown. As for the replacement bus service running in mixed traffic, yes, that is going to be annoying. TTC does not want to use the streetcar right-of-way understandably because of narrow clearances with the overhead poles and the meandering path the lanes take. Those poles (notably absent on Spadina) were put in despite many questions to the TTC (including from emergency services) about the need for this design. What was really happening was that there was a boffin in the consulting firm working on the new streetscape who wanted the street lighting poles (which traditionally held up the TTC’s overhead) to be spaced further apart than TTC requirements. In the fullness of time, this wasn’t how the street was built (because the illumination level would not have been adequate), but meanwhile the TTC insisted on its own centre median poles except where buses share the right-of-way west of Bathurst. It wasn’t a technical requirement, it was the combined stupidity of the street designer and the TTC’s sticking with a design that they no longer required. The result we have is a streetcar right-of-way that cannot host temporary bus service. There is a lot to complain about with the TTC, and I am often criticized for writing more about the negatives than the positives. However, this is a case where a great deal of work has been collected into one set of shutdowns, and that is precisely the sort of thing the TTC and City should be doing. This article is a follow-up to an early April review of the gains and losses brought by the St. Clair right-of-way and subsequent “transit priority” measures. 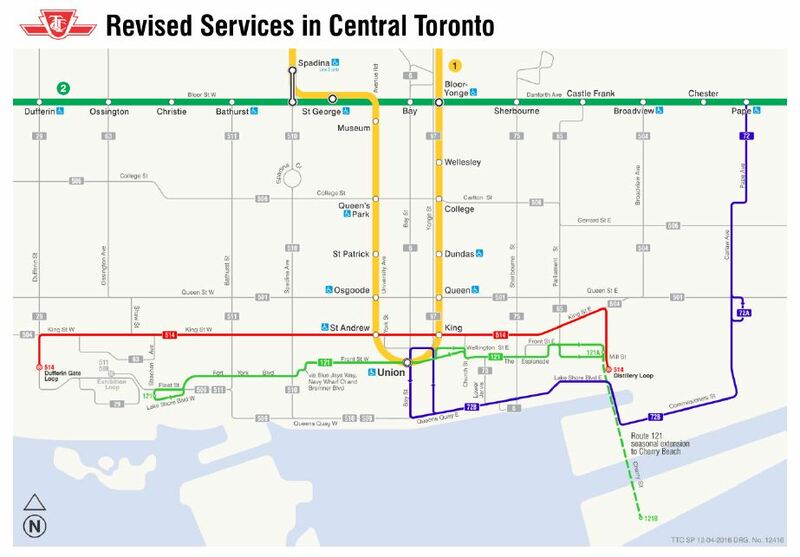 When it was published, the TTC had just changed schedules on this route to shorten trip times in response to repairs on several traffic signal locations where that “priority” function was not working. Did these repairs actually have an effect? How well did the line operate with less running time? Data for weekend operations has been added to the end of this article. There was a definite increase in travel times in fall 2014 as compared with summer 2010 when the right-of-way operations west of St. Clair West Station began. The location and severity of the problem varied along the route with notable effects between Bathurst and Oakwood where there are many traffic signals. The amount of running time added in the October 2014 schedules was slightly more than the actual increase in average running time over the route from 2010 to 2014. Travel times were reduced after the repair of transit priority functions at several signals along the route, notably in sections with many traffic signals. This did not completely reverse the longer running times of 2014. Short-turns as a proportion of all service declined with the new schedules in place. The increased supervision produced more reliable headways. The improvements of October 2014 have been slightly reduced with the new April 2015 schedules that clawed back much of the additional running time. For reference, here is a table from the first article showing changes in schedules for the route since 2007. Generally speaking, the April 2015 changes reduced one-way running time by 6 minutes during most periods with a few, minor adjustments to terminal “recovery time”. Those “recovery” values are as much a rounding factor to make the headway come out to an even value as they are a calculated amount of time needed to deal with random delays.